If you are having trouble getting SNAP installed let us know at: support@appliedprog.com. If you are experiencing a problem with a SNAP application or one of the plug-ins please first check to make sure that you have updated to the most recent version of the software. Before reporting a bug, first try to see if the problem has already been reported (see Issue Tracking). 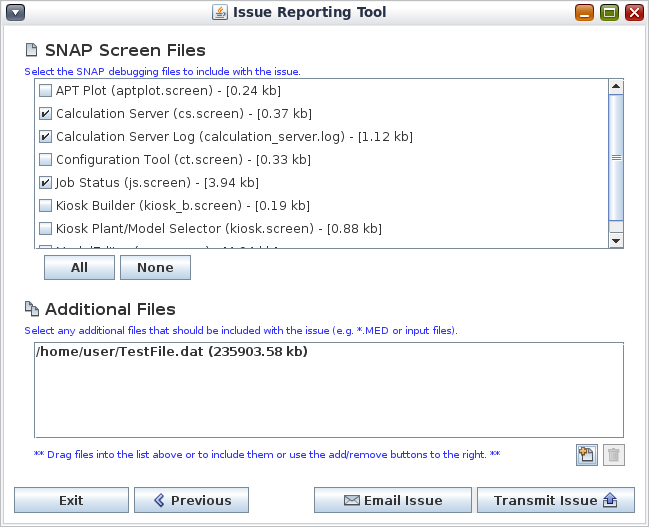 The best way to submit a bug report or feature request for SNAP is to use the Issue Reporting Tool installed with with the SNAP application suite. The Issue Reporting Tool will guide you through the process of generating and submitting an issue report. It is important to provide a detailed description of the issue. If possible, please include detailed instructions along with any files that may be needed to reproduce the issue. The tool will collect a set of SNAP debug and log files from the machine that it is run on. It is important to run the tool on the same machine that encountered the error and that it be run immediately after the issue is encountered. SNAP debug files are generally overwritten each time the application opens. As shown below, the tool will provide a list of all debug and log files that it finds. You can choose to exclude any of these files prior to submitting the report. 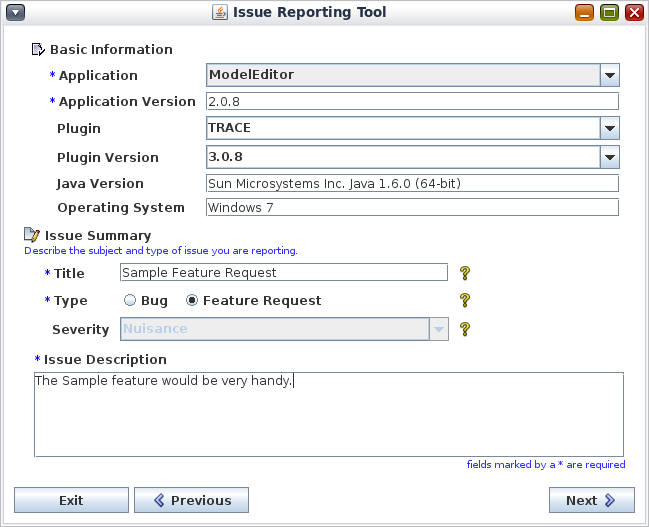 Issues can be uploaded to the APT issue tracking system directly over the internet directly from the Issue Reporting Tool. Alternatively, they can also be saved to a file and sent as an email attachment. The transmitted file is in ZIP format. All file attachments will be treated as proprietary data. Once uploaded, these files will not be accessible from the web site or bug reporting tool.